This blog is a record of my learning from Ruapotaka School through to Tamaki College. When it gets sunny the water from the sea, rivers, streams and earth goes to the clouds. This is called evaporation. Then it rains down. It rains to the ground and lands wherever it’s raining. The water cycle goes round and round again. Thank you for making your digital learning object about the water cycle. You have shown the cycle clearly. I like how you have described the evaporation from all the different places when it is sunny. Does that mean when it is not sunny that evaporation does not happen? I really liked the water cycle explanation writing you did. Did you enjoy writing about the water cycle? 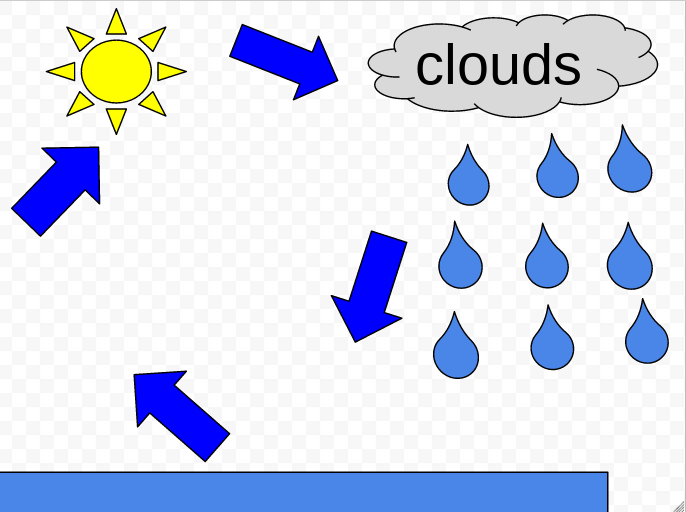 We did some water cycle explanation too.We really enjoyed doing the water cycle. Thank you for your comment. I don’t know the answer to your question but it is an interesting one, I might do some research on it. Invictus Games team returns home. Theme images by Naseko. Powered by Blogger.